Set your sights farther, get back on a bike and fit more awesome in your day with the motor-assisted Amiti E+. Using Liv’s 3F Design Philosophy, Amiti E+ was designed for a woman’s comfort and taste. The bike provides a lower stand over height, facilitating getting on an off the bike. 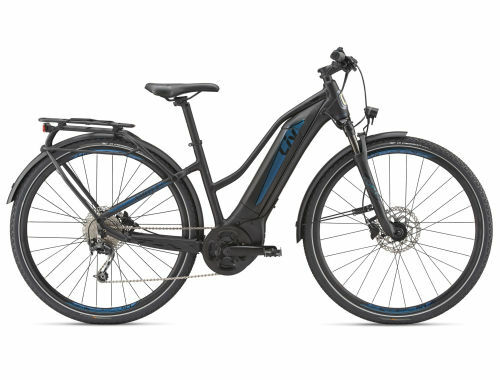 Amiti E+ is equipped with a solid braking system for loyal traction, an integrated day light on the head tube, fenders and tubeless tires for optimal comfort and safety. The handlebar-mounted control lets you adjust riding modes, and it has key data indicators – battery level, support level, speed and distance. This bike can take you from city streets to rough country roads seamlessly. Access to new roads and experiences is easily within reach thanks to the 200km range of the ultra-reliable downtube-integrated EnergyPak battery. The SyncDrive Sport Motor, powered by Yamaha, delivers 80Nm of torque and has five speed control settings ranging from 50-350% pedal assistance. Powerful disc brakes make variable terrain, from hilly city commutes to windy country roads a non-issue. The reliable and easy-to-access EnergyPak side-pull battery is beautifully integrated into a lightweight and durable ALUXX aluminum frame, designed and tuned for women using Liv’s 3F Design Philosophy for a bike that zips along on longer adventures. Integrated dropouts make adding accessories a cinch, and paired with fenders and an integrated light on the head tube, Amiti E+ is ready for comfortable commuting or awe-inspiring point-to-point treks. Pedal Plus 4-sensor technology smooths out bumps for a natural riding feel, and the ergonomic RideControl EVO makes controlling pedal assist functions second nature with handlebar controls and clear key data indicators. A suspension fork, all-terrain capable tires, and sloping top tube with low standover height specifically developed for women turns Amiti E+ into an approachable and bump-gobbling ride. Feel the freedom that comes with more time in your schedule conquering a ride in record time, explore more gravel paths and the roads, and spend weekends with friends outdoors. The Amiti E+ dissolves the barrier between you and your passion to pedal the journey. With the integrated motor and battery design, this is a bike that can keep up with your will to move! The wider tires add extra comfort and stability on any surface, making Amiti E+ the perfect bike to get you rolling. Feel the freedom that comes with more time in your schedule conquering a ride in record time, explore more gravel paths and the roads, and spend weekends with friends outdoors. The Amiti-E+ dissolves the barrier between you and your passion for pedaling the journey. With the integrated motor and battery design, this is a bike that can keep up with your will to move! The wider tires add extra comfort and stability on any surface, making Amiti-E+ the perfect bike to get you rolling. Designed from the ground up for women. Lightweight and durable ALUXX-grade butted aluminum for a nimble and durable frame. For precise braking and control in all terrain and variable weather conditions. All models come equipped with integrated dropouts to make adding accessories easy. Select models come equipped with a rear rack and fenders to make commuting a breeze! Tubeless-ready tires allow for more confident commuting, enabling the rider to run lower pressures for traction and comfort without fear of flats! Integrated DayLight on the headtube increases safety while riding in traffic, while the integrated night light makes early or late evening commutes possible. 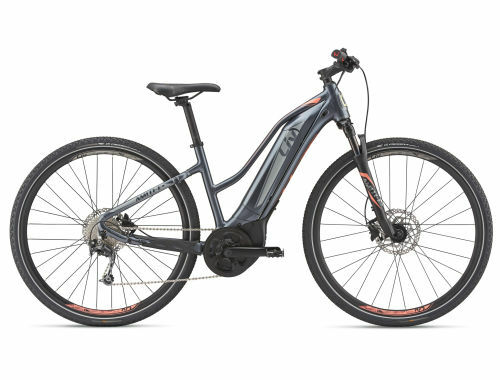 Reliably delivers smooth pedaling power to naturally extend the rider's ability. SyncDrive Sport delivers up to 80Nm of torque with three different levels of assistance: Sport, Normal, and Eco. 4-sensor technology uses speed, torque, motor rpm and pedal rpm to produce instant natural feeling pedaling assistance that maximizes energy efficiency. This ergonomic command center allows you to select the power assist mode with just a touch of your thumb. Fit, Form, Function ist die allumfassende Philosophie, die das Liv-Team leitet, wenn die Bikes für Frauen entworfen und entwickelt werden. Fit - Passform: Tatsache ist, dass keine andere Marke so viel Aufwand betreibt wie Liv, um perfekte Passformen für Fahrerinnen zu entwickeln. Um das Optimum aus jeder Form zu machen, arbeiten wir mit vier zentralen Elementen: 1. Globale Datenbank der Körpergröße 2. Einsatzzweck 3. Feedback der Profi-Fahrerinnen 4. Feedback der Kundinnen, die wir erreichen wollen Form: Bei Liv wollen wir Bikes entwickeln, in die sich Fahrerinnen verlieben, die Lust aufs Fahren machen und nicht zu übersehen sind. Jedes Jahr werden von unseren Designerinnen Farb- und Musterkonzepte entwickelt, die sich durch die gesamte Produktionspalette von Rädern, Zubehör und Bekleidung ziehen. Abgesehen von den Farben definieren wir die verschiedenen Kategorien der Liv- Bikes in Performance, Sport und Lifestyle mit einzigartigen Designs. Wir sorgen mit großer Liebe zum Detail dafür, Dich zum Radfahren zu inspiriere. Function: Liv definiert Funktion danach, was ein Rad in seinem Element leisten soll. Unser Ziel ist, leichtere, schnellere und effizientere Räder und Ausrüstung für jeden Fahrerinnen-Typ zu entwickeln. Das erreichen wir unter anderem, indem wir die Technologien und Kenntnisse nutzen, die bei den Giant-Herrenrädern perfektioniert wurden. Auch Komponenten haben eine erhebliche Auswirkung auf das Fahrverhalten eines Rads. Wir analysieren jedes Teil und entwickeln wichtige Komponenten wie z.B. Sättel weiter, um Deine Fahrqualität zu verbessern.